Congratulations to Professor Matthew England of the Climate Change Research Centre (CCRC) at the University of New South Wales. He is this year's winner of the Tinker-Muse Prize for Science and Policy in Antarctica. It's a prestigious award and comes with a prize of $US100,000. The Scientific Committee on Antarctic Research (SCAR) administers the award process independently of the Tinker Foundation. 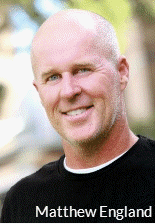 Professor England does a huge amount of research covering multiple topics. 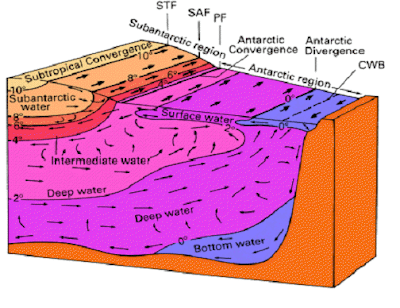 One subject on which he has made an important contribution is increasing our understanding of the Southern Ocean and the Southern Annular Mode (SAM). As stated on his website, "Quantifying the natural variability of Southern Ocean water masses, including their properties and overturning rates, is vital for detecting anthropogenic climate change." Summary: June 2017 was the fourth hottest June on record. The 12 months to June 2017 was the second hottest July to June period on record. According to GISS NASA, the average global surface temperature anomaly for June was 0.69 °C, which is 0.10 °C less than the hottest June in 2016, making June 2017 the fourth hottest June in the record. It's the hottest June in any year when there was no El Nino. 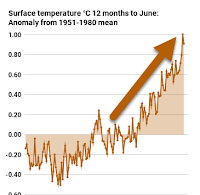 Below is a chart of the average of 12 months to June each year. 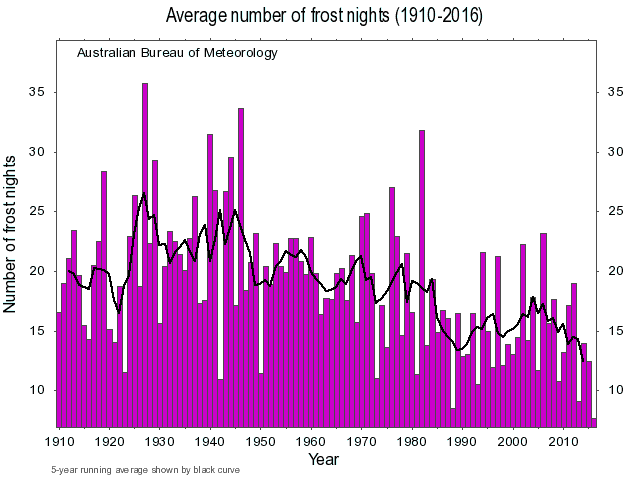 The 12 months to June 2017 averaged 0.91 °C above the 1951-1980 mean, which was 0.10 °C cooler than the 12 months to June 2016. This makes it the second hottest July to June 12 month period on record. 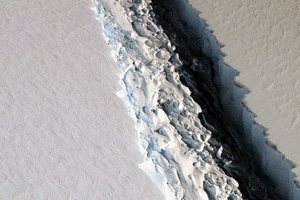 Most of you will by now have heard that the cracked ice shelf on Larsen C has split the whole way through. This means a gigantic block of ice is now floating free. It's got a name as bland as all the other recorded icebergs: A-68. The block measures about 5,800 km² in area and weighs more than a trillion tonnes. It is one of the ten biggest icebergs ever recorded. The weight is equivalent to the weight of 7,142,857,143 fully grown blue whales, the world's largest mammal. To visualise the area, think of somewhere that's 29 km by 200 km or 18 by 124 miles. 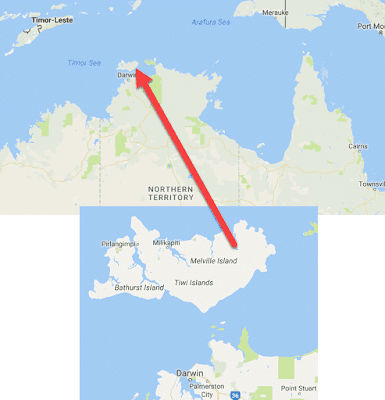 The iceberg is around the same size as Australia's largest island after Tasmania, Melville Island north of Darwin, which is 5,786 km² in area. There's an article at Quartz by Zoë Schlanger, Jennifer Brown and Katherine Ellen Foley, with some other international comparisons, for example, it covers an area twice as big as the Australian Capital Territory and 60 times the area of Paris. This isn't the largest iceberg ever. The largest recently recorded is B-15, which split off from the Ross Ice Shelf in Antarctica 17 years ago, in March 2000. It was almost twice the size of this one, measuring 295 km (183 miles) by 37 km (23 miles), and having a surface area of 11,000 km² (4,200 sq miles). Wikipedia also lists other recent large icebergs - here and here. The troposphere temperatures for June 2017 are out. This report covers the lower troposphere as recorded in UAH v6 and the new RSS TLT v4, and RSS TTT v4 for the troposphere (without the "lower"). It follows pretty much the same format as previous monthly updates. The troposphere is the part of the atmosphere directly above the surface. The temperatures are estimated from measurements recorded by satellites orbiting the earth. They are not direct temperature measurements (the satellites don't record thermometer readings). And they are of an average of a depth of the atmosphere - up to several kilometres above the surface. The different versions of reported satellite temperature data tend to vary more than different versions of surface temperature. For all three different temperature data sets shown, the 12 months to June 2017 is the second hottest 12 months in the record (comparing similar July-June periods). 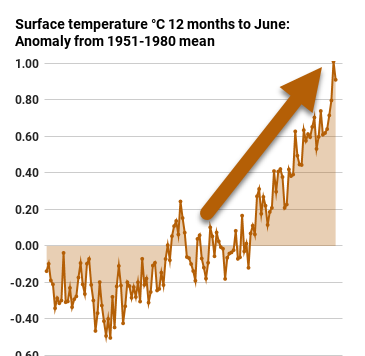 For RSS TTT (troposphere), June itself was the just the eighth hottest June, with June 1998 the hottest. 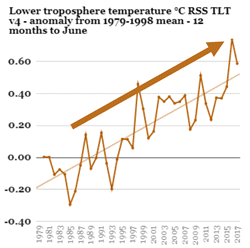 For RSS TLT (lower troposphere), June was the equal fifth hottest June (with June 2014). June 2016 was the hottest. The lower troposphere (UAH v6) June was the eighth hottest June on record. June 1998 was the hottest. It was so cold this morning that I had to hop into the fridge to warm up. It's winter, of course, but it got quite cold even for winter in this part of the world - measuring about minus 6.4 Celsius this morning at our place. Okay, I know for some of you that would be a mild winter's morning. Here it's worth lots of tweets. We're no longer used to having the sort of frosty mornings that were common when I was a child. 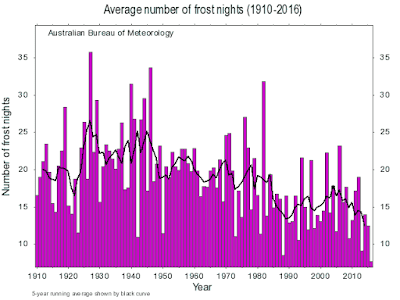 What used to be the norm has now become a novelty with the world warming up so much. 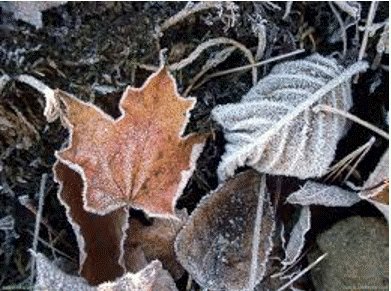 Deniers can get all of a twitter when there's a frost. They are scared that it means an ice age is coming. Take David Archibald. He's been predicting an ice age for something like twelve years, ever since (he says) he "started out in climate science". He says his first paper was written just a few months later, but the only place he could publish it was in the denier journal Energy and Environment.